I think I just found a hole in the space-time continuum. I'm reading this web page, and scrolling down as I go, and notice that the vertical adspace (eat for less...iPad...Ellicott City Moms...) scrolls with me. Pretty cool, but not too unusual. 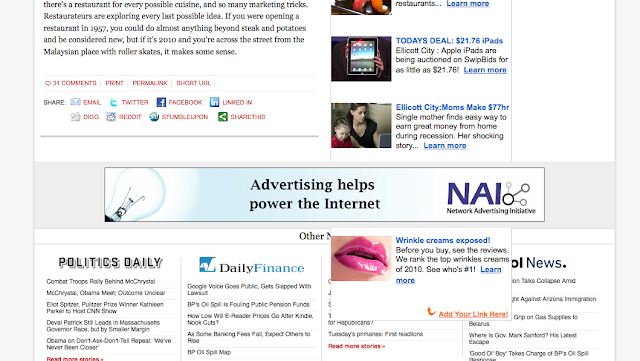 Then, as I approach the end of the article, I notice that a banner ad at the bottom of the page is layered OVER the scrolling ad (see how the "wrinkle cream" ad comes out beneath it?). So, I stop to read the banner ad, and it is...an ad for advertising. An advertisement for advertising that covers up another advertisement in order to gain attention. To quote the least intolerable character ever portrayed by Keanu Reeves: Whoa.